Posted July 21, 2011 by William Martin & filed under Galleries. The cover image for the latest issue of Doctor Who Magazine has been released. 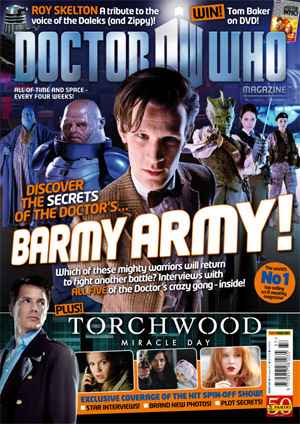 On sale from Thursday 27th July, priced £4.50, Issue 437 features interviews with all five of the Doctor’s battle allies from ‘A Good Man Goes To War’ and exclusive coverage of Torchwood: Miracle Day, including interviews, brand new photos and plot secrets. Filming on Series 6 of Doctor Who was completed last week and the show will return with ‘Let’s Kill Hitler’ in the autumn. > Follow us on Twitter to get the latest Doctor Who news and reviews first.